The Founders Award, an honor newly created this past year and to be presented biannually, was established in memory of Ray Goulet and Ed Hill, two of the Association’s founders and most dedicated and enthusiastic collectors. The award publicly recognizes an individual or an institution for long-standing and exemplary accomplishments in the disciplines of magic collecting and magic history that significantly reflect the mission and ideals of the New England Magic Collectors Association. 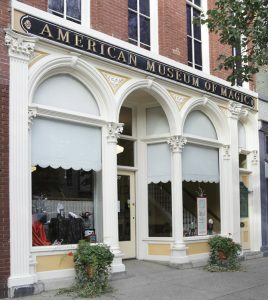 For 40 years, from April 1, 1978, the date Robert and Elaine Lund opened their beloved American Museum of Magic, the museum has been the home of the largest publicly displayed, private collection of conjuring artifacts, posters, books and memorabilia in the world. For four decades, the American Museum of Magic has collected and preserved rare and valuable treasures from magic’s storied past, becoming an irreplaceable research center for collectors and historians, as well as a renowned public attraction celebrating the lives of magicians and their contributions to the art of magic. For more details on the 2017 Founders Award and the American Museum of Magic, visit http://nemca.com/wp/2017-founders-award/. The American Museum of Magic is located at 107 East Michigan Avenue, Marshall, MI 49068. The museum is open to the public from April through December. Researchers should contact the museum for appointments. For more information, please visit the museum’s website at www.americanmuseumofmagic.org, or email info@americanmuseumofmagic.org. The museum telephone is (269) 781-7570. The New England Magic Collectors Association was formed in 1980 when Ray Goulet, Ed Hill and other like-minded area collectors gathered periodically to participate in what would be friendly exchanges of information about magic history and collectibles. Today, because the organization has grown considerably during its 38 year existence, members hail not only from New England, but from throughout the United States and Europe. Since its inception, NEMCA’s mission continues to be the promotion of interest in the collecting of memorabilia relating to magic and the sharing of knowledge and expertise in the collection and preservation of magic apparatus and literature. For further information regarding the New England Magic Collectors Association and for the upcoming Yankee Gathering XVII, November 15-17, 2018, please visit www.nemca.com, or contact Ray Ricard, 555 Newport Avenue, Pawtucket, RI 02861. Telephone: (401) 954-6237.